Saudi Arabia and United Arab Emirates (UAE) have some of the highest smartphone penetrations in the world, 76% and 75% respectively. Both countries have also embraced the shopping-as-entertainment culture. This inspired us to add Egypt into the mix and research how people use their phones while in stores and shopping malls, be that for shopping-related activities or just for entertainment. Full report below! Key findings: mobiles are changing shopping decisions! 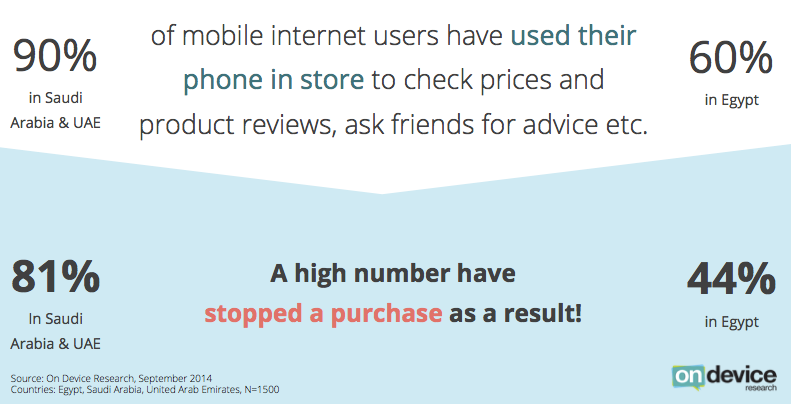 90% of mobile internet users in Saudi Arabia and UAE, and 60% in Egypt have used their phone while in store to check prices, product reviews, ask friends for advice etc. 81% and 44% respectively have stopped a purchase as a result of that activity! Saudi Arabia and UAE can easily be described as places where shopping is a national "sport". Staying outside is often not an option because of the high temperatures so shopping malls have become the go-to places when people want to go out for entertainment. For example, The Dubai Mall, the largest in the world, houses 1200 stores and attracted over 65 million shoppers in 2012, more than visited New York that year. Egypt has traditionally been associated with market stalls and small, local shops. For large portion of the population this is still the case but for the growing middle class things are changing. 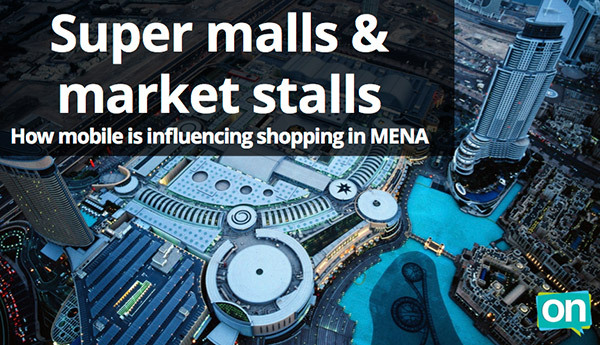 International brands like Marks & Spencer, Ikea, and Zara have entered the market while shopping centers such as the Mall of Arabia in Cairo challenges others in the region in size and choice of restaurants and entertainment venues. The survey was conducted by On Device Research, a global mobile research panel provider, in September 2014. We targeted a representative sample of mobile internet users in each country. In Egypt 70% of the respondents were using feature phones while in Saudi Arabia and UAE majority of the respondents were using smartphones. Request report data in Excel! Full data from this report is available on request at no cost. You'll get breaks by age, gender, and device type + much more detailed view into answers.